The South by Southwest (SXSW) Interactive conference kicks off in Austin, Texas, tomorrow, and by the sound of things the event will continue growing in importance as a breakout affair for some of tomorrow’s biggest applications and ideas. What applications and ideas will be hot this year? Pre-event chatter points to the continuation of some themes from last year, as well as the arrival of new concepts. For the past few years, SXSW has been about mobile, social, location-based apps. Last year group-messaging apps like GroupMe were hot. I expect those themes to return this year, with a new wave of apps that add their own twist. But some new technologies will come to the foreground this year, too--namely apps that specialize in "ambient social" features, social aggregation, new approaches to politics, and personal data control. People in the wireless world have dreamed of an app that would help you introduce yourself to people you want to meet--such as in the classic scenario of the person in a bar who spots someone of interest across the room, and wants to meet them without going in blind. Currently no app perfectly suits such "cold calls," but a lot of apps at SXSW this year try to fill that purpose. One writer has dubbed them “ambient social” apps, a very fitting name: They sense people who are in your vicinity, and try to help you make real-world connections with those people. The app that seems to be generating the most pre-event buzz is Highlight. If someone standing near you also has Highlight on his or her phone, your phone will detect them, and their profile will show up on your handset. You can see their name and photos, but you can also see things that you two have in common, such as mutual friends or favorite TV shows or bands--perfect fodder for an introductory conversation. Later, if you run into the same person and can’t remember their name (a huge problem of mine), the app reminds you. So far, one thing the app is taking some criticism for is that it runs constantly in the background on your phone, which contributes to battery drain. Also, Highlight is only for the iPhone right now. Tech pundit Robert Scoble was perhaps the first to bless this app, and he believes that it will be hot at SXSW (yes, I realize that this article and others will help to make it so). 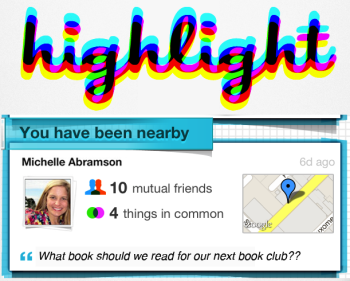 And Highlight is one of those apps that actually seem to do something useful and helpful in real time (the mark of a breakout app of any kind). However, the creep-out factor--and the cost to personal privacy--might offset the benefit completely. One comment at the App Store seems to sum up this concern nicely: "I've seen similar apps and this one really worries me because it uses Facebook--strangers being able to see my FB name, profile pic, interests and exact location is creepy. (Do you want a weird stranger saying "hi" to you?) I'm a guy and using this has ME sketched out, so I can imagine girls will be even less comfortable with it. The lack of privacy settings and use of FB info makes this really creepy." Another similar app, called Sonar, is also enjoying attention, and it is available for Android phones. Uberlife (see the screenshot at left), takes a slightly different approach to the same scenario. 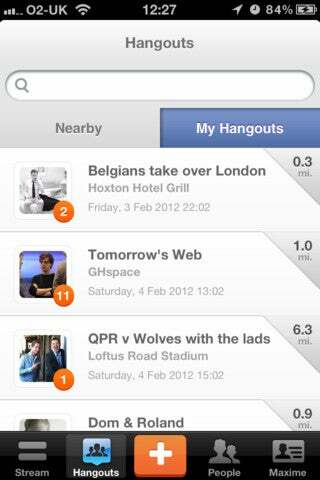 This app lets you start instant “hangouts” for events you attend or places you visit. For instance, if you pop into a bar for an after-work beer and need some drinking buddies, you can start a hangout and broadcast your request to your network and to the Uberlife user community. Somebody who is in the neighborhood might come and join you. If a whole group of people shows up under one roof, you get points in the apps. You can also post about the event while it’s happening, creating a record that you can revisit later. If you meet some new people you like, you can ask them to hang out again. Of course, the huge problem with these apps is that they will help you only if your friends--and more important, the people you want to be your friends--are also using the app. I can see an app debuting in future SXSW shows that leverages a mobile platform everybody already uses (such as Facebook mobile) to help users make connections with anybody in the bar who has a smartphone. Another slant on this idea would be an app that can detect and integrate with any mobile app that contains the personal information, common friends and interests the user wants to make "public". So the person in the bar using the app could get help making a connection with someone across the room, regardless of what mobile social app that other person happens to use. 5Degrees takes on another aspect of the social app fragmentation problem. Increasingly, our contacts live in various silos on our phones and PCs--we have our Facebook friends, our Twitter pals, all our email contacts, and even some contacts in other social apps such as Foursquare or Gowalla. Some of our contacts are walled away behind the device they live on; for example, your smartphone contacts might be separate from the contacts on your tablet. Mobile phone makers have been trying to create apps that bring all this stuff together on a handset, but with limited success. 5Degrees is a free-standing app that does the job more effectively, and more neatly, than other apps I’ve seen. And it makes your unified contact list available on all of your devices. The developers call it a “mobile relationship manager,” and it will be getting a good amount of attention at SXSW this year. The idea of making the electoral process online, mobile, and social will have more presence than ever at this year's SXSW. In the year since attendees last gathered in Austin, the Occupy movement has gone mainstream, and dissatisfaction with government has reached all-time highs. The mood seems right for Politics 2.0 apps to be taken more seriously. I’ve been getting email messages from companies in this line--moreso than in years past. One organization, Americans Elect, has created an online platform in which people can sign up and nominate their choice of presidential candidate. By the end of June, delegates from across the country will nominate through online voting a presidential ticket that will appear on general election ballots nationwide in November. This will happen completely independently of the existing party systems, and the organization has worked to gain the approval of state and federal election officials, so when participants nominate someone, it means something. With awareness growing among consumers about the way Internet companies are using their personal data, many SXSW attendees will be discussing the problem of data security and privacy this year. Green’s company, Personal, operates a personal private network where you can manage and control access to your own digital information. Personal says it hopes to overturn the model for how Internet giants such as Facebook and Google track, obtain, and profit from personal information, to create a more willing, mutually beneficial model that gives control back to the consumer. Yay. I will arrive in Austin on Saturday, and will immediately begin filing blog posts on the new apps, ideas, and interesting people I find there. Stay tuned.